They sum up perfectly the mood of this watershed film, floating, it seems, on the back of a swan, even if towards a terrible waterfall. A Dream within A Dream is also the title of the feature length documentary on the 2 Disc Collector’s Edition which contains interviews with all the key players including director Peter Weir and Anne Lambert who stars as the enigmatic Miranda. While only in the film for a mere 35 minutes Miranda’s presence is palpable throughout and her soft focus, slow motion image encapsulates what was later to become known as the picturesque period in this country’s film history. Lambert, who is currently gracing screens in Somersault, modestly claims that her character’s iconic status had nothing to do with her and that it was all a media beat-up. She also expresses disappointment in the new Director’s Cut saying that the film was no longer Weir’s to tamper with but belonged to audiences who have, over nearly thirty years, taken it to their hearts. For Weir, however, the revised version with some scenes deleted only increases the tragedy, and what a tragic tale it is. 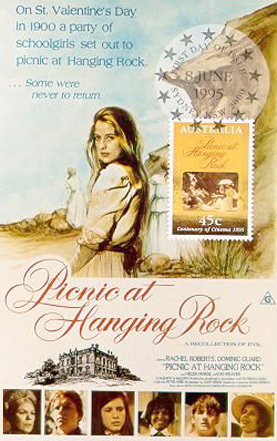 Three school girls disappear at Hanging Rock on St. Valentine’s Day; virgin brides, perhaps, claimed by the very land itself. Part fact, part fiction, the story captured the country’s collective consciousness but the author of the novel on which the screenplay was based, Lady Joan Lindsay, took the mysterious secret with her to her grave. As the director points out, it’s the only film he’s ever made without an ending and while he got lucky once, he’ll never attempt it again. The conclusion that we’re left with is, as Mlle Poitiers (Helen Morse) reveals: “Miranda is a Botticelli Angel”, maybe even Venus herself, and the others her maidens in waiting, none of them really meant for this world.